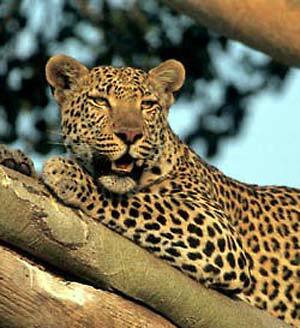 The Leopard - it can run up a tree after a monkey, as easily as a cat does after a bird. he leopard is a beautiful animal, though very savage and cruel. It is about as large as the largest of our dogs, but it looks much more like a cat than a dog. You have watched kittens at their play a hundred times, and you know how very quick, and pretty, and graceful all their motions are. It is just so with the leopard; and it can creep along too, as softly as a cat, and run up a tree after a monkey, as easily as a cat does after a bird. It lives mostly upon young antelopes and deer, and it often lies still a long time watching one till it comes near, and then springs out upon it. The Bible says in one place, "A leopard shall watch over their cities; every one that goeth out thence shall be torn in pieces;" and in another, "Therefore will I be to them as a lion; as a leopard by the way will I observe (or watch for) them." The leopard runs very swiftly when it is trying to overtake any animal: the Bible says, "Their horses are swifter than leopards." Its color is a clear, handsome yellow, spotted with black; the spots are found in little groups, two, or three, or four together, and the skin is very smooth and shining. There is such a great difference between the color of the spots and the rest of the skin, that you would think it a very curious looking animal. The 23d verse of the 13th chapter of Jeremiah is this: "Can the Ethiopian change his skin or the leopard his spots? Then may ye also do good that are accustomed to do evil." It would be no easy thing to wash away the leopard's black spots; indeed nothing but God's power could do it. So it is not easy to do right when we have been used to do wrong, and have loved to do it: this is why we need to pray that God will "create a clean heart and renew a right spirit within" us. Should we not be careful about every sinful habit? Remember, dear child, that such a habit in you may become fixed, almost like the leopard's spots; and pray God to help you love every thing that is "pure, and lovely, and of good report." What a peaceful and happy time that will be, when Jesus our Savior shall reign in all the earth-when all men shall love him and each other-when "the leopard (fierce and cruel as it is now) shall lie down with the kid; and the calf and the young lion and the fatling together; and a little child shall lead them." That bright day is coming; and if you love Christ, even you-a child-can do something to prepare for it.